As the school year comes to a close, the inevitable question arises for graduating students: What am I going to do? Some of you have a plan. Some of you already have a job or have been accepted into a graduate program. And then some of you have no clue. What is life after school? After years and years of being in the classroom, what to do afterwards can be daunting or freeing – or a little bit of both. Keep learning! Too many people shed their graduation robes and are glad this learning thing is over, glad to never crack open another book ever again. It becomes a workaday world. Get ready for work. Go to work. Finish work. Go home for some well-deserved downtime in front of the television. So little time, so much to watch. As more and more people are choosing Apple TV or something similar over paying for cable, it’s so easy to waste a lot of hours in front of the television. Now that binge watching is the rave and, frankly, with premium channels the quality of the programming has improved, why not watch all five seasons of “Breaking Bad” and follow that with both seasons of “House of Cards,” and why not follow that with “Mad Men,” and on and on forever! The people making those shows…well, they are making those shows, not sitting around watching them. Pick up a book. Or download it onto your device. Disappear into a world of your imagination. How often do you hear anyone say, “Oh I just saw the movie and it was so much better than the book.” No one. Ever. Keep reading! Go places and do things! You are about to embark on the rest of your life, and if you would prefer not to end up a lyric in a Talking Heads song (“You may find yourself behind the wheel of a large automobile/You may find yourself in a beautiful house with a beautiful wife/You may ask yourself, well, how did I get here? )” — explore! Of course, there are those of you who know who you are and what you want to be, and you know how to get there, and you are on your way. The path will always be there. If you have a dream that you have always harbored in your heart but have been told it’s not realistic, or you have not allowed yourself to dream it for fear of venturing off your path, do more than dream it. Do it! If you want to go to be ski bum, move to Telluride and figure out how to make it work. If you want to travel through Australia for a year, you can find a way to make it work. If you would prefer not to face that cubicle and you want to work as a landscaper in the Rocky Mountains for a summer, someone will need you and give you the job. Go do it! You may even find yourself forging a new path instead of trudging down the one that is already beaten. Be who you are. We are lucky to be living in a time during which people are increasingly accepting of lifestyles. (Well, that one can be argued, but for the purposes of this opinion, let’s say it’s true.) Be bold enough to know yourself. When Ellen DeGeneres announced she was gay, it temporarily derailed her career. Her TV show was canceled, and for a while she was saddened and angry. But when she started receiving letters from people telling her that her courage spoke to them and they were no longer suicidal, she said she knew she had done the right thing. She returned to her own TV show three years later, has hosted the Academy Awards and Grammy Awards, has won 13 Emmys, and achieved numerous other milestones. Have the integrity to be honest. The world will open to you. School might be over but the rest of your life has just begun. Continue to learn. Be adventurous. Be true. Be free. Be well. Mark Routhier is an assistant professor of directing and acting at the University of Central Florida and director of new play development at Orlando Shakespeare Theater, a partnership with the university. He can be reached at markr@orlandoshakes.org. 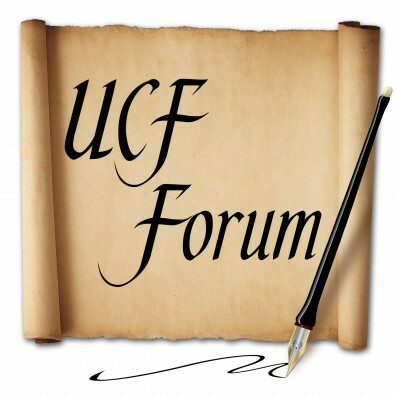 The UCF Forum is a weekly series of opinion columns presented by UCF News & Information. A new column is posted each Wednesday at http://today.ucf.edu and then broadcast between 7:50 and 8 a.m. Sunday on WUCF-FM (89.9). The columnists serve on the UCF Forum panel for a year.